Accommodation: Comfortable hotels in Kathmandu and Pokhara and local lodges on the trek. The most popular in Nepal, The Round Annapurna Trekking is one of the top ranked trekking destinations in the world. Having one of the classic treks in the world Round Annapurna has diverse geographical feature and are rich in its culture and nature. It takes a week around the Annapurna Himal followed by the courses of two mighty rivers: The Marsyangdi in the east and the kaligandaki in the West. The trail ascends steadily to the 5400 meters Thorung La Pass, lies in between the upper ridges of the rivers. To make you sure you have a safe and joyful trek having right equipment is must. Culturally rich region offers spectacular eco-diversity enrooting highest mountain pass in the world Throng Pass (5414m), onto upper Manang (Muktinath temple) and down to the world deepest Kali Gandaki gorge. Stretched in 55 km (34mi) highlands it is the home of thirteen mountains over 7000 m and 16 mountains over 6000 m along with the most attractive Annapurna I, (8091m/26545ft) world’s 10th highest mountain. Drive from Kathmandu to Besi Shahar (830m/2723ft). Driving 5:30hrs, Overnight at guest house. Drive to Syange and trek to Chamje(1560m/5118ft). Driving 2 hrs and Trekking 4-5hrs , Overnight at guest house. Chamje trek to Dhararpani (1810m/5938ft). Trekking 5-6 hrs, Overnight at guest house. Dharapani trek to Chame(2725m/8940ft). Trekking 5-6 hrs, Overnight at guest house. Chame trek to Pisang (3190m/10466ft). Trekking 5-6 hrs, Overnight at guest house. Pisang trek to Manang(3500m/11483ft) Trekking 5-6 hrs, Overnight at guest house. Rest in Manang for acclimatization, Overnight at guest house. Manang trek to Yak Kharka (4090m/13418ft). Trekking 5-6 hrs, Overnight at guest house. Yak kharka trek to Throung Phedi(4441m/14570ft) Trekking 5-6 hrs, Overnight at guest houseplan. Thorung Phedi trek to Muktinath via Thoroung-la passes (5416m/17769ft). Trekking 9-10 hrs, Overnight at guest house. Muktinath trek to Jomsom (2720m) .Trekking 5-6 hrs, Overnight at guest house. Jomsom trek to Lete (2480m) .Trekking 5-6 hrs, Overnight at guest house. Lete trek to Tatopani( 1110m/3636ft). Driving 6 hours, O/N at guest house, FB plan. Tatopani trek to Shikha( 2020m/ 6116ft) Trekking 5-6 hrs, Overnight at guest house. Shikha trek to Ghorepani (2834m/9298ft). Trekking 5-6 hrs, Overnight at guest house. * 1 night hotel in Pokhara on B/B basis. * Necessary Permit & National Park fees. * TIMS(Trekkers’ Information Management System) Fee. 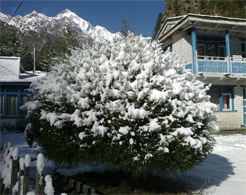 * Trekking accommodation at lodge(Tea House) &food(breakfast,lunch,dinner) during the trek. * During the trek and required staffs. * Normal filter water will be provided. * Meals, accommodation, salary, insurance, for the trekking guide and potter staff. * Drive back to Kathmandu by tourist bus . * Breakfast,Lunch and dinner during Kathmandu & Pokhara Stay.